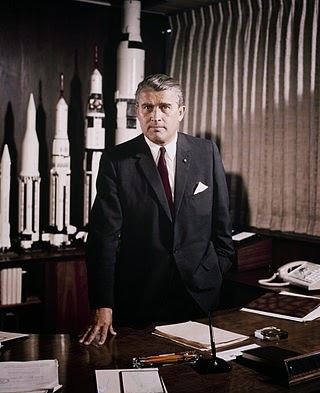 Werner von Braun, with models of the Saturn rocket. Herbert discovered that traveling a few hundreds miles for a job in his own country could be a disorienting experience. "I look upon my trip to late '50s Alabama as my first visit to a foreign country," he writes. "Alabama in 1957 was indeed for me a foreign country, with its incomprehensible deep South dialect, its peculiar patterns of racial segregation, its colorful Bible-belt fundamental preachers on the stairs of the Huntsville Court House, born-again Baptist tent revivals in the countryside and the ever-present feeling in the air (and in the public statues of Confederate heroes) that for many residents of Alabama the War Between the States was still current news. I was often referred to as a 'Yankee'."